David Cameron has promised that the new Justice Bill would "put beyond doubt that home owners and small shopkeepers who use reasonable force to defend themselves or their properties will not be prosecuted". Yesterday, Mr Clarke spelt out the sort of action that would be permitted under the new regime. He made clear that it would remain illegal to pursue intruders to attack them or to shoot them as they fled. The Justice Secretary said: "If an old lady finds she has got an 18 year-old burgling her house and she picks up a kitchen knife and sticks it in him, she has not committed a criminal offence and we will make that clear." He added: "There is no doubt that you or I or anybody else is entitled to use reasonable force to defend ourselves and to protect ourselves or our homes or both. That has to be the law and we are going to make that absolutely clear. We are clarifying the law. "We will make it quite clear you can hit the burglar with the poker if he is in the house and you have a perfect defence if you do so.'' Mr Clarke accepted that the defence of reasonable force already existed, but said: "Given that doubts are expressed, we are going to clarify that. It is quite obvious that people are entitled to use whatever force is necessary to protect themselves and their homes. "What they are not entitled to do is go running down the road chasing them or shooting them in the back when they are running away or to get their friends together and go and beat them up. Of course the key to this reform is how it is framed. I know I am in danger of mixing my metaphors but there is potential here to open a whole new can of worms. Once the Government has extended the right of self-defence to cover property then prosecutions could become impossible, even if an attack on a burglar takes place whilst in 'hot pursuit'. I just hope that they have thought this through. This morning's Independent details yet more Liberal Democrat influence in Government with a report on a speech by Nick Clegg in which he will promise to make communities "masters of their own economic destinies" by handing them more power over spending. Speaking at a local government conference, Mr Clegg will signal legislation giving councils more control over the taxes they raise. They will also be able to borrow against income from business rates to fund investment in their areas. The Liberal Democrat leader is to say: "Every Government preaches localism. This Government will practise it. "In terms of real decentralisation, money talks. "We need to reverse decades of centralisation to make our communities masters of their own economic destinies. "We have to create the conditions for communities to invest in their own success. "That means putting our money where our mouth is to give you proper power over spending as well as more control over the tax you raise and keep so, for example, you can fight for businesses to come to your town. "You know we'll shortly be publishing detailed proposals for consultation. "I can also confirm we will follow that consultation with a Local Government Finance Bill, so that this power shift is set in statute." Mr Clegg will say that allowing business rates to be retained locally could mean councils have direct control of more than 80% of their budgets, rather than the 50% currently. He will also offer a guarantee that deprived areas will not lose out from the shift, insisting: "From the start, no authority will receive less funding when the new arrangements are introduced than they would have done previously." A system of Tax Increment Financing will permit councils to obtain finance against business rates, "helping to unlock the development potential of their areas". The deputy prime minister will say: "You asked for new borrowing powers and to be given back business rates - we're delivering it. You've told us you want change but any reform must be fair - we've heard you. But now it's up to you to help us make this work. We have an unmissable opportunity here. If we get this right we can win the argument for localism once and for all." Mr Clegg will also announce the nationwide introduction of Community Budgets, where cash for local services is pooled to help deal with problems more efficiently. In the case of one family in Salford, 250 interventions were required in one year - including 58 police call-outs and five arrests; five emergency hospital visits; two injunctions; and a Council Tax arrears summons. The council's Community Budget approach saw the creation of a joint prevention and early intervention team, and is said to have cut the £200,000 cost by two thirds. The question now is to what extent will this agenda be taken up in Wales. I never ceased to be amazed by the obsession of the media with the money spent campaigning in local elections or referenda. This is particularly so given that by and large there is no public money involved. The vast majority of funds are raised privately. Nevertheless this Walesonline story today highlights that campaigners for a Yes vote in March’s referendum on the Assembly’s powers spent 35 times more than their No-supporting rivals. The site says that the figures, published by the Electoral Commission, show that those campaigning for a Yes spent just over £140,000 while those campaigning for a No vote spent under £4,000. It is believed that of that money spent by No campaigners, £500 went on an inflatable pig. Well at least we know one of the reasons why the 'yes' campaign won. In an open letter to the bosses of gas and electricity suppliers, Energy Secretary Chris Huhne calls for them to offer their ideas within the next fortnight and reach an agreement by the end of the summer. If a voluntary deal cannot be reached, he is threatening to use powers in the Energy Bill to impose requirements for companies to make bills clearer and help people save money by switching to the most cost-effective tariffs. The Government believes eight million households are paying more than they need to simply because they do not pay by direct debit, for example. Action on the issue was part of the Coalition Agreement. Fewer than one in five people are shopping around and switching energy company each year. People are missing out on the opportunity to save, in some cases, literally hundreds of pounds. Plaid Cymru Leadership contender, Elin Jones is quite right when she says in this morning's Western Mail that First Minister Carwyn Jones’ ability to negotiate with the Conservative-Liberal Democrat Government in Westminster is undermined by Labour’s refusal to introduce such reforms under prime ministers Tony Blair and Gordon Brown. The First Minister has been highly vocal since Labour lost power at Westminster in calling for a reform of the Barnett formula and yet shortly before the 2010 election then-Treasury Minister Sarah McCarthy-Fry sent a letter to the Scottish Government’s Enterprise Minister Jim Mather stating that the “Government currently has no plans to change the Barnett formula”. The Labour Chief Secretary to the Treasury also ruled out reform. Requests to Labour Ministers for the Welsh Government to have responsibility for power generating projects over 50mw were also rejected by Labour and yet, as soon as Carwyn Jones found himself in some difficulty over wind farm proposals for Mid Wales, he rushed off to Westminster to demand changes with the intention of putting that particular hot potato into the hands of the UK Coalition Government. Of course this does absolve the responsibility of the Coalition Government to address these issues, it just means that Wales has a weaker hand in negotiations, one that will not be helped by Labour's political posturing. Our job now is to ensure that the Calman-style review of Welsh funding mechanisms promised by the Coalition addresses the Barnett formula as well, bringing in at the very least a floor that will prevent Wales falling behind England in terms of funding per head. I also believe that the quest for responsibility over large scale energy projects is not lost either. What the Welsh Government need to do to advance this cause however, is to demonstrate that they have mechanisms in place that will treat these applications with the appropriate seriousness. These mechanisms must take account of the national interest as well as local considerations. So far that has not happened and I believe it is one of the reasons why Wales has been unsuccessful in achieving its goal on energy. Going to London and banging the table will not cut it. It is not leadership, it is grandstanding and it wins no friends amongst UK Ministers and their officials. If the Welsh Government want an adult dialogue then they need to act appropriately. Back in August 2009 the Home Office issued new guidelines to all Chief Police Officers in the UK regarding the taking of photographs in public places. Contrary to some popular myths it is not illegal to take photographs of landmarks or even of children in public places. However, if a police officer believes that you are acting suspiciously they have the right to challenge you and seek an explanation for your actions. Police do not have the right to confiscate equipment with very good reason nor do they have the right to delete photographs or force the photographer to erase them. Important: Legitimate journalistic activity (such as covering a demonstration for a newspaper) is likely to constitute such an excuse. Similarly an innocent tourist or other sight-seer taking a photograph of a police officer is likely to have a reasonable excuse. A fanily on a sightseeing trip were stopped by police and questioned under anti-terrorism laws for taking pictures. Neil Kitchen, 46, of Swansea, and his 24-year-old nephew were on a day trip to see Gloucester Cathedral when they say they were stopped by a police officer who demanded to see their camera. The pair had been taking pictures of a former cinema in the city’s shopping district that had been converted into a pub. After being questioned by the officer they were handed stop-and-search notices on which Mr Kitchen’s nephew, who has learning difficulties, was described as “acting suspiciously”. I am astonished that incidents such as this are still occurring. Ed Miliband's determination to extend his own tenuous control over the Labour Party by abolishing shadow cabinet elections may not extend to reducing the power of the union bosses. This morning's Independent suggests the contrary but closer reading indicates that all that is intended is to reach out to grassroots workers so as to mobilise them for Labour causes. The paper says the Labour leader said that he wanted to "reach out" directly to three million nurses, call-centre workers, engineers and shop workers who are affiliated union members. They also say that he wants to reduce union influence on policy-making at party conference. However, not only are there no concrete proposals in the speech to achieve this but also no explicit pledge to change the way that Labour elects its leader. A direct contrast to the shadow cabinet announcement. The only conclusion that can be drawn from this is that Miliband is talking the talk but has no intention of undermining the union power base that put him in charge. Without that sort of strong and detailed reform he will find it difficult to convince anybody that Labour have changed. The most curious incident he records concerns a tour of Wales in the Seventies. Postlethwaite thought the tannoys in the dressing rooms were monitoring him and believed Aberystwyth was the centre of a secret cult. He was plunged into a full-blown episode of paranoid schizophrenia. “I was in meltdown… It was terrifically frightening.” He walked off the stage mid-performance and “was gone for two or three days, nobody knew where, not even me”. It is true that listening to the locals jabbering in the Welsh can tip any average person over the edge, but it is also germane that Postlethwaite was meant to be starring as a lunatic in an adaptation of One Flew Over the Cuckoo’s Nest. That is possibly the most offensive passage I have ever read about the Welsh language. Are we really meant to take this review seriously? Will foxes and badgers feel the love? According to today's Independent animal campaigners believe that this week's dramatic vote to outlaw the use of wild creatures in circuses could prove a turning-point in the drive to combat animal cruelty. It had been widely assumed that the influx of large numbers of Conservative MPs at the last election would tip the balance against animal welfare issues. But a succession of recently elected Tories intervened during Thursday's impassioned debate to support an outright ban and to condemn the conditions endured by circus animals. The main backbencher to speak out against the move, the Tory Andrew Rosindell, was jeered by MPs of all parties, including his own, as he declared animals in circuses suffered "almost no cruelty" and urged ministers against "pandering to the emotions of animal rights activists". So overwhelming was the mood in the Commons that the Government was forced to abandon efforts to force MPs to support its alternative proposal to license circuses. Backbenchers are also determined to return to the subject if ministers prevaricate on implementing a ban. The attitude of the Commons on circus animals has implications for the Government which must soon decide whether to implement plans to combat rising levels of TB in cattle by culling badgers. Ministers have been agonising since September over whether to authorise a cull, and admit there is a "question-mark" over whether it will happen. Part of the reason for the dithering by the Government appears to be the risk of widespread protests – backed by MPs – over the mass slaughter of animals. Polls suggest that only one in six of the public supports a cull. The Labour MP Paul Flynn, a long-term supporter of animal rights, said the circus vote was a "deeply significant" moment despite being a relatively narrow issue. One Tory MP puts her finger on the change in attitude: Tracey Crouch, the Tory MP for Chatham, who was elected last year, said the increase in Conservatives opposed to fox-hunting reflected the rising numbers representing urban areas. She added: "Animal welfare is incredibly important to the general public. More people give money to animal welfare organisations or join them than join political parties or even vote. Clearly we are a nation of animal lovers and I think politicians are reflecting that." What is interesting is how this is better reflected amongst Conservative members in the House of Commons than those in the Welsh Assembly. Considering that the Assembly is meant to be closer to the people and better in touch with the public mood, the gung ho attitude of some AMs, particularly in the Conservatives and Plaid Cymru, is really quite puzzling. At least last week's statement on the badger cull showed that we now have a substantial number of AMs who are starting to understand the mood of their constituents with regards to animal welfare issues. At roughly the same time as Shadow Secretary of State for Wales, Peter Hain announces that Labour must abandon the “control freakery” which dogged the Blair and Brown governments, Ed Miliband proposes that he wants to change his party's rules so that he can choose who he wants to sit in the shadow cabinet. The Labour leader has decided his party's MPs should lose the right they currently have to elect the party's top team every two years because he believes that shadow cabinet elections distract Labour from holding the government to account and preparing the party for power. Of course such a move would also increase the power of patronage available to the Labour party leader and help avoid the inconvenience of sitting with shadow ministers who are not entirely convinced of his fitness to lead. Perhaps Ed and Peter Hain need to talk so as to coordinate their messages better. Then again, as Peter Hain failed to get elected in the last Shadow Cabinet Elections and relied on Ed Miliband co-opting him to his current post, maybe he takes a different view. I await his statement with interest. The BBC report that the Welsh Local Government Minister will be coming to the WLGA Conference in Swansea this morning so as to throw his weight around. Apparently, he is going to announce that he will legislate to give him the power to force joint appointments on local Councils. It is not yet clear what the nature of these joint appointments will be but it seems fairly clear that they will be limited to local Councils when the natural way forward might be to have combined officer roles for local government and the health service within the same area. Of concern is that the Minister does not seem to understand what he wants from this process other than a superficial show of progress towards joint working. As the WLGA have pointed out the real savings to be made are in integrated services not in post holders, and experience shows that the best way to achieve that is from the bottom-up, where all stakeholders buy into the process. The danger is that a joint appointment at Chief Executive or Chief Officer level that has been forced upon Councils will prove divisive, unaccountable and ineffective without a greater integration of services. It is a profoundly superficial approach to joint working that indicates that the Minister is more interested in being seen to do the right thing rather than making progress. You say that you do not want reorganisation, yet you are calling for joint appointments, without an apparent appreciation of the complexity and implications for the organisations concerned. I do not think that you can have it both ways. What lessons have you learned from the collaboration projects that are already underway around Wales? In my discussions, one thing that local government has learned is that it is not a quick win, but that it requires resource, commitment and time. It is not for the fainthearted either. There are cultural issues around risk aversion and vested interests, there is a need for dedicated support and capacity to make progress, a need to break down silos and a willingness to compromise. Any collaboration requires strong leadership. Therefore, when you look at it from that point of view, you can see that the sort of partnership and collaboration that everyone in the Chamber supports is not as simple as just standing up there to take the blunderbuss approach that you have hitherto taken—'It must be done or else’. That is the impression that you have given in the Chamber. I am sure that that is effective in some environments, but perhaps not in a complex environment such as local government. Can you, therefore, confirm that you understand that complexity and the need for that joint working to be nurtured rather than forced upon local government? Leadership, in this case, involves more support and constructive joint working on your part as well as on the part of the Welsh Local Government Association and other partners if we are to achieve the objective that we all want, which is delivering value for money from the sort of projects that are already proving successful, such as in Gwent and elsewhere. Can you also confirm that, when you talk about these sorts of joint working partnerships, the bodies and services for which the Assembly Government is responsible, such as health and the Environment Agency, are also in the mix, so that we can get a properly joined-up public service across all sectors within Wales? The Minister's answer was astonishing in my view. He said that he not agree with many of the things that I said despite the fact that much of it was self-evident and came from documents that studied the lessons to be learnt from collaboration and joint working. He continued: The method that I am using is about taking people with us. I am trying to guide local government into working together better. The simple principle of whether it is cheaper and whether it will deliver a better service is not too hard for anybody in local government—and certainly not difficult for the Welsh Government—to understand. If we are going to have governance like this, from the back of an envelope for the next five years then I fear for the future of local democracy. We all want value for money and a better service but they can not be delivered by forcibly dismantling democratic structures and dictating from the centre. Ultimately, the most effective driver for efficient service delivery is the ballot box. Make that more potent and Councillors have nowhere to hide. Issues with politician's expenses in Westminster may well be overshadowed following a decision in the European Parliament to release a secret report detailing the widespread abuse of expenses by MEPs. The Independent say that a meeting of senior MEPs is expected to accept a European Court of Justice ruling that there is an "overriding public interest in disclosure". They add that tThe decision will increase pressure on the parliament to publish more details of the expenses claims of MEPs including their travel expenditure, attendance records and the highly controversial €4,300 (£3,800) "go anywhere" budget given to members. A lot of credit for this has to go to the campaigning efforts of Liberal Democrat MEP, Chris Davies. It is difficult to disagree with him when he says: "Bit by bit the parliament is being brought kicking and screaming towards transparency. I was delighted by the European Court's decision. There is still a long way to go but I would hope pressure will now build to identify what was done to pursue those MEPs identified by Galvin as misusing the system." The new Environment Minister, John Griffiths has just announced that the badger cull in North Pembrokeshire has been put on hold whilst he reviews the available evidence behind that proposal. In the chamber I said that this corrects the mistakes of the former Rural Affairs Minister in taking a political decision to carry out a cull based on a misinterpretation of the science. However, we cannot lose sight of the need for effective action on bTB and that is why the government need to look afresh at the available vaccines. Our Government commitment is to carry out a science led approach to evaluate and review the best way of tackling bovine TB. My aim is to ensure that the existing measures continue to be fit for purpose. To this end I have agreement from Cabinet to commission an expert panel to peer review the scientific evidence base regarding the eradication of bovine TB in Wales. Its eradication is a long term commitment that will require the application of new technologies and scientific developments as they become available and, which the Welsh Government will continue to monitor. I have asked the Chief Scientific Adviser, Professor John Harries, to oversee the review.. He will appoint an independent panel to undertake the review. The panel will be chaired by an independent expert with the other members being recognised experts in areas relevant to this review. The Chief Veterinary Officer for Wales and her office will help provide the evidence and any technical expertise that is required to support the review. The review group and its terms of reference will be established as quickly as possible to ensure that the Wales TB Eradication Programme does not lose momentum. Professor Harries and the expert panel’s chairman will report their findings to me. A timetable for the completion of the review will be established with the formulation of the panel and its terms of reference. This morning's Western Mail reports that the governments in Westminster and Wales are locked in a stand-off, after First Minister Carwyn Jones made an impassioned demand for powers over energy projects. I happen to support the devolution of power over energy to the Welsh Government as do the Welsh Liberal Democrats. However, if yesterday's refusal was a 'slap in the face' for Wales it will not be the first one on this issue. In fact previous Welsh Governments have made similar requests and been refused by the Labour UK Government. It is only when Carwyn Jones was painted into a corner by his own policies on wind farms that he became 'impassioned' on this issue, in an attempt to displace blame for the problems caused by TAN8 to rural and urban communities alike. Whereever the decision is taken on large energy projects they will be based around the planning framework that the Welsh Government has put in place for such projects. If Carwyn is serious about helping out then he will review that policy as a matter of urgency. His views are thought to reflect a range of opinion within Liberal Democrats in government. A source close to Huhne said he was supported by the business secretary, Vince Cable, and Lib Dem ministers were braced to do battle over hundreds of regulations they believe their Tory colleagues will be inclined to discard. The move is part of a Lib Dem strategy to fight their corner more aggressively that has been evident in the party leadership's successful opposition to the NHS changes. Huhne said: "Between the obsession with micro-management and target-setting displayed by the Labour party, and the fixation with deregulation and scrapping rules just because they are rules on offer from some rightwing ideologues, we Liberal Democrats have a real chance to define an evidence-based, intelligent and distinctive approach." This is yet another useful distinction between the Liberal Democrat position in Government and that of our Conservative coalition partners. Personally, I would encourage this sort of public debate on ideological priorities as a means of asserting the differences between the two parties and underlining the level of influence that the Liberal Democrats are exercising in Government. I would however take issue with the Guardian in describing the Conference as being for Social Democrats. It was not. I would describe myself as a Social Liberal and I came into this party from the Liberal tradition. The distinction between the two no longer exists in our party. What we have instead are two different views of Liberalism that owe more to William Gladstone and David Lloyd George than to George Brown. Should Britain be worried by the Greek financial crisis? Those who argued that Britain should not enter the Eurozone are no doubt feeling vindicated this morning as the Greek financial crisis threatens to bring the currency crashing to the ground. The fact that we are not in it owes something to politics but also to the economics of entry. Put simply the circumstances under which we might consider joining the Euro were never right. However, that does not mean that the project was wrong-headed or even that we should not consider signing up at some stage in the future if both the British and the European economy meet stringent conditions and if they survive this present crisis. The UK may not be in the euro, but be in no doubt that the continent is far and away this country's most important trading partner. As it is, the UK, behind France and Germany, provides the third-highest amount of bank and private lending to Greece. If the crisis spreads to the other economies that have struggled so badly in the financial crisis – Portugal, Ireland and Spain – then it will hurt the UK. Britain is particularly exposed to the Spanish and Irish property markets, which have already been brought to their knees. Any further collapse could expose British banks to some of the worst effects of the crisis. Greece in particular, is learning the lesson of an over-reliance on the public sector and a failure to take account of the impact of debt on the economy. Their position provides a strong argument for the present Government's austerity measures and why deficit-deniers like Ed Balls are wrong. However, the impact of their crisis on Britain could be very severe indeed, not least because of the international obligations entered into by the last government and the effect it may have on our trade. If the Euro-project falls apart then our current financial problems will be compounded. That is an outcome that even Euro-sceptics should not wish for. The BBC report that Peace campaigner Brian Haw has died after "a long hard fight" against lung cancer. Mr Haw, who was 62, is famous for having set up a camp in London's Parliament Square in 2001 in protest against UK and US foreign policy. His tenacity and his commitment turned him into a minor celebrity as he defied attempts by Tony Blair to legislate his protest out of existence. His peace camp was a major thorn in the side for the Blair government and a constant reminder of the significant opposition that existed around the country to the Iraq war amongst other foreign policy adventures. A lot of people I know consider politicians to be the lowest form of comedian anyway so it seems entirely appropriate that today's Independent should use Nick Clegg's rather funny jokes earlier this week to focus on some of the best political one-liners of the modern age. "Whatever people say about Chris Huhne, I don't know any politician better at getting his points across." "Look at Ryan Giggs, look at Ed Miliband. One is a fading left-winger who's upset his brother and is having a difficult time with the press – and the other is a footballer." "I stole David's football, so he nationalised my train set." "At least I won't have to worry about her running off with the bloke next door." "He's passed from rising hopes to elder statesman without any intervening period whatsoever." "Greater love hath no man than this, that he lay down his friends for his life." "In politics, you should never completely rule out falling back on the truth." "Harold Wilson is going round and round the country stirring up apathy." Maybe Nick Clegg should re-use the Lloyd George quotation when he pushes through his own reform of the House of Lords. Ed Balls call for a temporary cut in VAT was an audacious move to get him onto the front pages. However, in the cold light of day it looks ill-judged and opportunistic. Don't take my word for it. But this is a case of right diagnosis, wrong prescription, because a cut in VAT, as Mr Balls proposed yesterday, makes sense only if one wants to shovel £2.5bn a month out of the Treasury as fast as possible. That is costly for a policy whose effect might be drowned out by higher inflation. More sensible and politically adept might be to bring forward a public infrastructure project in an effort to create jobs. The big job for Labour, though, is not to dream up a couple of policies but to work out a cogent position on the deficit. No sign of that yet. Some former Labour ministers privately believe Mr Balls’ speech is another manifestation of a tendency to “deficit denial”. Not quite the impact he was hoping for really. Under the heading 'Silent assassin' today's Daily Telegraph reports on revelations in a new book by journalists Mehdi Hassan and James Macintyre that they say makes some startling claims about the way the Labour leader conducted his bid for power. A pivotal moment came in February last year, when Ed met the former Labour leader Lord (Neil) Kinnock, who told the authors: "I told him [Ed], if we lose, given the condition we are in, he should run for leader... He told me he had thought about it a lot... He couldn't give me the answer. I replied by imploring him to do it for the party. Think of the party, not David... He told me, 'Because it's you who has raised it I'll have to give it more thought'." More interestingly, Ed Miliband's allies began mobilising support for his leadership bid on the weekend after the general election, whilst Ed was part of the Labour team trying to negotiate a Lib-Lab coalition with senior Liberal Democrats. That underlines accounts from David Laws amongst others that Labour were completely disengaged from the process of negotiation and were more interested in getting on with being in opposition than in making a serious bid to be back in government with the Liberal Democrats as a partner. Andrew R.T. Davies: Anyone else? Kirsty Williams: Andrew, I would have thought that you of all the people would realise that it is not size that matters, but quality. [Laughter.] As I said, my colleagues will go on to talk about the individual programmes in greater detail. The Deputy Presiding Officer: Order. Mark Isherwood, sit down for a moment. Can we have a bit more decorum? Even the new Members seem to be getting overexcited. I want to hear what the Member has to say. Perhaps he should look up the word 'decorum' before the next Plenary session. Normally drugs and horse racing only exist in crime thrillers, where a less-favoured animal is given some substance to make it perform better. However, according to today's Telegraph the real world has intruded onto the sport of Kings in a very different way. The move comes amid a police crackdown on drug-taking at the five-day event. Officers with sniffer dogs have been patrolling the grounds to identify spectators carrying narcotics. The initiative saw two people arrested on suspicion of possessing cocaine on the first day of the Berkshire meeting, which is attended by the Queen and members of the royal family. Just when Ed Miliband thought that he could move on from his recent internal party problems, Labour's most successful leader wades in with some good advice. Mr Blair said embattled Mr Miliband would be WRONG to pull back from his own forward-looking philosophy, WRONG to shift from the centre ground of politics and is WRONG to declare the days of New Labour were over. And in another move that will infuriate the rookie Labour leader's inner team, Mr Blair insisted PM David Cameron's keystone health and education reforms were RIGHT. Turning to the Coalition, he said plans for the NHS and schools - bitterly opposed by the current Labour leadership - were in fact continuations of his own policies. He said: "I think some of the technical aspects of reform - competition in the NHS, putting the patient first, breaking up the traditional state school system in favour of academies and trust schools - these were things we started. What is the betting that Mr. Blair's words are quoted back at Ed Miliband at some stage in the House of Commons? There is little doubt in my view that if I were to choose the best bits of the BBC their historical documentaries would be up there as some of the most intriquing and interesting television on offer. How do you shoot yourself in the head with your own bow? In 1552, Henry Pert, gentleman, in Welbeck, Nottinghamshire, drew his bow to its full extent with the aim of shooting straight up into the air. The arrow lodged in the bow, and while he was leaning over to look, the arrow was released. He died the next day. Of embarrassment. Still, I suppose it beats dying by falling out of bed. Personally, I am a big fan of new technology, especially if they enhance security. One of my main criteria in assessing a new car, after the environmental considerations of course, is how many gadgets it has in it. The Moelfre all-weather lifeboat on Anglesey was launched at 9.20pm on Sunday after the emergency signal was detected four miles off Point Lynas, near Amlwch. They conducted an exhaustive search of the area fearing a boat, which can also be fitted with the GPS devices, had sent the signal before sinking. But after an investigation by coastguards it is now suspected the signal had come from a tracking device on a BMW or Volvo vehicle travelling on a Dublin to Liverpool ferry, and police are also investigating. Holyhead coastguard said it was the first time they had launched a rescue because of such a device but warned it could become more common as more vehicles are fitted with tracking systems. Mark Craddock, watch manager at Holyhead, said: “We were called by police at 8.46pm on Sunday as they had been informed that a tracking device signal had been detected, and that its location was four miles into the sea off Anglesey. It was an Emergency Telematics signal from a GPS system that is fitted as standard into new BMW and Volvo vehicles. “Similar systems can also be used on vessels so we had to treat this seriously. We were concerned that there had been a signal and then it had gone, so it was feared a boat could have sunk or the device switched off for another reason. “We had to treat this as a worst case scenario and Moelfre lifeboat was launched to search the area. The call was logged as a false alarm with good intention. The impact of the Liberal Democrats in Government has once more been underlined this morning with a major success in removing the worst aspects of the NHS reforms in England. However, as the Daily Telegraph says, this is not the only area in which we have influenced the Government agenda for the better. The paper says that the Prime Minister has also retreated on a plan to cap state welfare handouts at £26,000 a year, on Council refusals to bring back weekly bin collections and in the fact that the reduction in the number of foreign students will now be half the figure previously indicated. Nick Clegg's hard work on this needs to be acknowledged. He has ensured that the Liberal Democrats are nobody's poodle but instead are ensuring that their bite in government is potent and effective. It seems that Energy Secretary, Chris Huhne was as shocked as me by the decision of Scottish Power to raise its gas prices by 19% and electricity tariffs by 10%, adding 48p a day, or £175 a year, to the average daily combined gas and electricity bill of its 2.4 million customers. He has suggested that consumers should hit back by shopping for cheaper alternatives, something that is actually quite easy to do. The problem is that very few people do it. Only about one in six ever switch suppliers. If you want to do that then here is the place to start. There is also quite a high level of ignorance about the social tariffs that are available. If you are on a low income many energy companies have schemes that can help you pay for your gas and electricity and pay off arrears. Go onto the company's website and search for it. The last time I shopped around I managed to almost halve my energy bills with the same supplier. That was a real shock and underlines how these companies are ripping off their customers by not automatically giving them the best deal. I am pleased that Ministers are thinking about seeking powers to force companies to reveal to every customer on their bills whether they are on the cheapest tariff, amid concerns about lack of transparency. The changes, which could be announced as soon as this week, are expected to force the big six – which have their own power stations – to auction up to a fifth of their generated output on the open market to make it easier for new players to enter the market. The new measures are also expected to ensure that the huge array of tariffs – which has grown by 70% since 2008 to nearly 350 – are dramatically reduced so that customers can more easily compare prices between suppliers. Ofgem first announced these proposals in March, following a four-month investigation. The regulator gave the big six – Scottish Power, nPower, EDF, Scottish and Southern, E.ON and British Gas – until 1 June to "engage constructively" with its proposals or face a referral to the Competition Commission. This abuse of economic power has gone on too long and needs to be curtailed. David Cameron may be having enough problems keeping his government on message but on Thursday he fell victim to a stunt by the most wilfull member of his own household. The Prime Minister, sitting in a Mini Cooper outside No 10, was due to thank BMW chairman Norbert Reithofer for £500 million invested in the Mini factory in Cowley, Oxfordshire. But minutes before Mr Reithofer arrived, Larry chose to make a foray outside the famous black door. 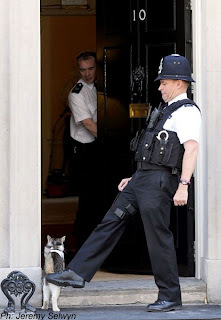 The four-year-old tabby dodged political aides and scampered around, causing a furore in front of photographers. Eventually a police constable grabbed the feline and escorted him inside - with a friendly kick. Larry has a bit of a reputation for being feisty. The paper says that he famously lashed out at ITN reporter Lucy Manning, scratching her four times. It may all be ancient history to Ed Balls, who is quoted this morning as lamenting the publication of his private papers for 'political motives', but the revelations contained within the documents serve as a useful reminder for just how strife-ridden and useless Labour were. The latest insight is a document by civil servants urging spending restraint from the Labour government in 2006. The file was written when Tony Blair was PM and Mr Balls was a backbencher. The BBC say that this latest document, published by the Telegraph put forward ideas for savings ahead of the Comprehensive Spending Review of 2http://www.blogger.com/img/blank.gif007. It suggested that departmental spending increases above inflation ought to become the exception not the rule. The Conservatives claim this advice was "recklessly" ignored. The paper says he would have told Labour's conference that the party's greatest danger lay in underestimating the challenge of the deficit, and that it was vital to regain the public's trust on the economy. The Labour narrative that all the country's economic ills are the fault of the coalition govenrment and that spending cuts are unnecessary and ideological, is starting to come apart at the seams. For some inexplicable reason, the belief that Twitter is a recent invention is now widely entertained. Nothing could be further from the truth. Though of late it has made use of the latest technology, the service was in widespread use as early as the 1920s. Several times a day, the Twitter boy would bicycle up the drive here at the hall in his buttoned suit and peaked cap, bringing a short message from one of my friends: “OMG Winston Churchill has rejoined the Tories”, “WTF is the Commonwealth Party??? LOL”, that sort of thing. Then there was the role of the notorious “Zinoviev Tweet” in Labour’s defeat in the 1924 general election. Truly, there is nothing new under the sun. There is, however, one important difference between Twitter now and then. Back in the twenties, someone like your diarist, who had many followers and a great deal to say for himself, kept simply dozens of Twitter Boys in useful employment, crisscrossing the country on their bicycles. Today those self-same messages go by electric interweb while the youths sit in bus shelters drinking white cider. The revelations in today's Daily Telegraph of the 'key role played by shadow chancellor Ed Balls in a “brutal” plot to destroy Tony Blair' is really no surprise. We all knew that it was happening. What perhaps, we did not know is the extent of the scheming involved and the depth of the bitterness between the two sides. By comparison, coalition politics looks like a picnic in the park. This newspaper has seen letters between Mr Blair and Gordon Brown which reveal the extraordinary rift at the heart of Labour. The cache of documents show for the first time Mr Brown’s feelings towards Mr Blair in his own words and handwriting, material which has previously only been the subject of speculation and second-hand reports from anonymous sources. Mr Brown makes it clear, in a series of memos, that he regarded his rival as a “muddled” lightweight whose obsession with spin destroyed trust in politics. He used the perception of “lies” over the Iraq War to try to force Mr Blair’s early departure. Mr Brown ordered Mr Balls to take a “brutal” approach to cleanse the Labour Party of Mr Blair’s influence. They give an insight into Mr Balls’s central role in the plot, with Mr Brown passing his former aide the most secret memos that Mr Blair sent to him in confidence. The files disclose details of secret meetings, opinion polls on Mr Blair’s policies and how Mr Brown’s allies tried to rebrand his image. Three of the key conspirators now occupy the most senior positions in the Labour Party: Mr Balls, Mr Miliband and Douglas Alexander, the shadow foreign secretary. More than 30 people, including figures in politics, business and the arts, are named as being involved. Most were rewarded with peerages or government positions by Mr Brown. Private memos between Mr Brown and Mr Balls heavily criticise Mr Blair, and the pair discussed how to undermine the Prime Minister. Throughout this period Ed Balls was denying that he was involved in undermining colleagues. If I was Ed Miliband I would be very nervous indeed about the intentions of the Shadow Chancellor. By far the most bizarre aspect of the plot was the decision to christen the plot 'Project Volvo' on the grounds that this was the car voters most associated Gordon Brown with. Just how robust is a Volvo in a car crash? Personally, I found the Archbishop of Canterbury's comments on the UK coalition today to be quite predictable. What was puzzling though was his claim that the government is forcing through "radical policies for which no one voted". That is the problem with coalition government of course, things are not clear-cut when it comes to assessing their mandate, though it has to be said that the combined vote of the Conservatives and Liberal Democrats exceeds 50% of those voting. In a representative democracy based on an unfair electoral system it is often difficult to identify how any government has secured a mandate for a particular policy. Labour for example, introduced tuition fees and top-up fees despite explicitly ruling them out in their manifesto and they were a single party government with a Parliamentary majority. The fact is that governments have to react to events and often their actions have not been predicted in their manifestos simply because they were unaware as to how forces outside their control would develop after they took power. More fundamentally, where was Rowan Williams during Tony Blair's government? In 2005 Labour won 35.2% of the vote, amounting to just 21% of the 44 million people eligible to vote, and yet Tony Blair commanded 55% of the seats in the House of Commons. If there was ever a case of a government forcing through changes that people did not vote for then that was it. I am afraid it is a case of 'move along, there is nothing to see here'. The Archbishop of Canterbury would be better advised to restrict his comments to the policies themselves rather than get embroiled in a debate on mandates. It really is not as straightforward as he implies. What will new Government do on the badger cull? There was an interesting exchange in Plenary today in which one of the new Plaid Cymru AMs demanded to know whether the Welsh Government planned to go ahead with his party's plans for a badger cull in North Pembrokeshire. It seems that Plaid has learnt nothing from this controversy at all and intend to continue pressing for an poorly-evidenced solution that cost their own Minster thousands of votes last month. As the BBC reports Carwyn Jones was coy on the subject. He refused to say if his government will go ahead with the cull. "The government's pledge is to consider the science regarding bovine TB," said Mr Jones in response to a question by Plaid Cymru's Llyr Huws Gruffydd. "This is something that we look at continually, every week, every month to see what the most effective way of dealing with bovine TB is, which is a problem for a lot of dairy farmers in Wales." Although the BBC refer to the new Deputy Minister for Agriculture, Alun Davies as a supporter of the cull, he does not in fact have resposnibility for bovine TB. That baton is firmly in the hands of new Environment Minister, John Griffiths. John Griffiths is due to give a statement on this issue in Plenary on Tuesday 21 June. I have no idea what he will say but if he is serious about basing policy on science then surely there must be a u-turn. Perhaps those who feel as strongly as I do on this issue should start lobbying him in advance of his Plenary appearance. Having exposed some very dodgy claims amongst MPs, the Daily Telegraph has a new target, spending by civil servants using departmental credit cards. However, they are meeting quite substantial resistance. It is a familiar pattern. An emergency meeting of civil servants from throughout Whitehall has been called and it is understood that they are looking for ways to prevent full disclosure. One senior Whitehall source claimed officials were involved in what amounts to a “cover up”. The source said: “This is not about ministers not wanting this information out there. It is about senior civil servants worried about their past spending, much of it when they were in control of departments during the Labour era. It is understood that accounting officers and some permanent secretaries are keen to avoid disclosure. I am not going to rush to judgement and say that these cards are being abused until I have seen all the evidence. Clearly, though the paper thinks that this is the case. Either way, it is only right that the information is made available so we cab judge for ourself. With the Coalition Government under constant fire almost since its first day in office, Labour should be riding high in the polls. The fact that they are not and the problems that Ed Miliband is having in establishing himself as leader, has led to a sense of crisis. So much so that according to the Daily Telegraph, Ed Balls and Harriet Harman have been forced to stop attacking the Government so that they can go on the media to deny there is a problem. It is not just Sepp Blatter who is in denial. Mr Balls said the party was not guilty of showing "arrogance" in the wake of last year's defeat, but he admitted that Mr Miliband needed more time. The shadow chancellor told Sky News: "Ed is leading us in the right direction. There's more work for all of us to do, we've got to be out there and the people have got to say on the economy, on crime, look, Labour are the people standing up for us, they are the party of government who happen to be in opposition." Miss Harman, the deputy leader, denied that Labour was facing a financial crisis. She said: "It's not true [that] we have a huge funding problem. It absolutely isn't." Reports in the Financial Times seem to contradict both politicians. Not only does Labour have a funding problem but it also appears to be suffering a credibility gap as well. Many former donors have turned their backs on the opposition party, leaving it increasingly reliant on unions, which provide the bulk of its private income. Labour’s corporate and individual donations of £248,577 for the half-year to March were dwarfed even by those to the Liberal Democrat party, which received £871,019, according to data from the Electoral Commission. Instead, the majority of Labour’s income was from unions (£4.7m) and the taxpayer’s contribution to opposition party costs (£5.7m). The trend partly reflects the fickleness of donors for a party that entered opposition last year for the first time in 13 years. But it comes amid uncertainty among corporate leaders and former donors over whether Mr Miliband is genuinely pro-business and understands their concerns. It may not be a full-blown crisis yet but it is drifting that way. The moment when an idea achieves universal consensus is often precisely when the concept starts to eat itself. The steep rise in values made British homes very pricey relative to income. Then came the financial bust and much tighter rationing of mortgages. A slew of surveys and reports has recently confirmed just how tough it has become to get a foot through the door. The average age of a first-time buyer fell to around 25 when Mrs T was in her pomp; it has now climbed to 37; the National Housing Federation forecasts that it could soon rise to 43. The postwar trend of more owning and less renting is sharply reversing. It may be a little premature to pronounce the death of the property-owning democracy. It is fair to say that it is having extreme difficulties with breathing. Fewer people owning their homes means fewer people with money in property when they become elderly to support their retirement and care. They will be losers when young and losers again when old. Our already highly unequal society will become even more dramatically divided by the widening wealth gap between home-owners and the rest. This will entrench the privileges of the baby-boomers, who got into property while it was still affordable, over younger generations who find that the ladder has now been pulled up beyond reach. Britain needs to build more houses. In just one year, 1953, Harold Macmillan presided over the construction of 300,000 new homes. He understood that a property-owning democracy could not be realised unless there were enough properties. This basic requirement eluded his successors, whether they were Conservative or Labour. The social housing sold off by Mrs Thatcher was never replaced. House building in the last year of Gordon Brown fell to a postwar low. We are currently building around 100,000 homes a year when new household formation is running at about 250,000. So long as demand continues to be so much greater than supply, the prospects for the young – and a lot of the not so young – will become ever bleaker. Politicians still talk about a property-owning democracy, but it is just piffle and wind unless they do the necessary to make it a property-building one. This is particularly important in Wales where the Government's own research says that an estimated 284,000 additional homes are required in Wales between 2006 and 2026. 183,000 of these are in the market sector and 101,000 in the non-market sector. These estimates average 14,200 dwellings a year - 9,200 in the market sector and 5,100 in the non-market sector. In addition, there is a current backlog of unmet housing need which is estimated at 9,500 households. Unless we start to hit these targets then the property-owning democracy will be a thing of the past. Plans by a number of Plaid Cymru Assembly Members to boycott the offical opening of the Welsh Assembly on Tuesday have made the headlines as they intended. Leanne Wood, Bethan Jenkins and Llyr Huws Gruffydd are planning on carryng out a series of visits and other engagements instead of taking their seats for the ceremony that will mark the start of the ability of Assembly Members to make laws in our own right. There is no doubt that the trio are sincere and as a republican myself I understand why they do not support an unelected monarchy presiding over an elected Parliament. However, that did not stop them taking the oath of allegiance to the Queen, nor does it prevent them serving as a member of a body that constitutionally takes its authority from the crown and whose laws have to be approved by the monarch, no matter how academic that approval may be. Nor can they deny that the monarchy enjoys majority support amongst Welsh people, who expect their elected politicians to represent them at events such as this. Irrespective of my personal views my duty on Tuesday is to be in the Assembly representing my constituents at the official opening and celebrating the birth of a new phase of Welsh democracy. As a Liberal Democrat I have had to put up with a lot of abuse from Labour over benefit reform and the attempt by the Coalition Government to put right their mess and get the economy on track. In some cases, such as with disability benefits there are valid criticisms that need to be addressed, but in many other ways proposed changes are just continuations of policies started under Labour or have broad support from the opposition parties. In the second quarter of 1997, when Tony Blair took office, there were 184,000 households where no adult had ever worked. In the second quarter of 2010, when Labour left office, the figure was 352,000. Earlier ONS figures suggest that as much as half of the increase in workless households was explained by the increase in the number of students in higher education. But critics of the last Government said the figures showed that Labour had overseen a growing “culture of welfare dependency” in Britain. The figures from the ONS Labour Force Survey showed that in the second quarter of 2010, a total of 552,000 adults were living in households where no one had ever worked. A third of those were in student households where residents chose not to work because of their studies. That leaves 374,000 adults who could work but have never done so, living in a total of 269,000 households. Those households were home to 258,000 children, the ONS calculated. Studies show that children growing up in workless households are more likely to end up without work as adults. In total, 632,000 adults and children are in households with no experience of work. Only 13 per cent were classified as “unemployed” and declaring themselves available to work. This is evidence of the culture of benefit dependency that grew up under Labour. No wonder they are shouting so loud. They are hoping to distract us so that we wouldn't notice. According to this morning's Daily Telegraph, the Government is planning to save up to £10 billion by rationalising its procurement policies, particularly in the area of office supplies. Cabinet Office Minister, Francis Maude, has claimed that improvements have already saved £1 billion in 2010/11. He estimates that another £2 billion of savings will be made this year and next. In 2013/14 and the following year, savings will reach £3 billion meaning that total savings in the current four-year spending round would be around £10 billion. Public bodies have been paying as little as £350 and as much as £2,000 for the same laptop, he said. Prices paid for identical printer cartridges varied from £85 to £240. Under the new system, all central government bodies will be able to order three different sorts of office notebook, instead of the dozens of different colours, sizes and types currently being purchased. Incredible! I will certainly look upon Staples in a different light after this. This morning's Independent reports that the personal spin doctor and attack dog for the embattled Health Secretary, Andrew Lansley, has been muzzled, after senior Liberal Democrats objected to her alleged rubbishing of Deputy Prime Minister, Nick Clegg, and other Liberal Democrat ministers. Earlier this month, Mr Clegg told the BBC's Andrew Marr Show that the reforms were being pushed through too fast, that the 2013 deadline should be put back and that GPs should not be forced to sign up to the new commissioning consortiums. Senior journalists then received emails from Jenny Jackson, quoting things that Mr Clegg had said about the NHS reforms before his party suffered setbacks in the May local elections and the referendum. The clear implication was that the Deputy PM had changed his tune after his party's drubbing at the polls. The email outraged senior Liberal Democrats. Ms Jackson was already in their sights after an anonymous briefing in April in which a "Tory insider" belittled the contribution of Liberal Democrat junior ministers in Government departments headed by Conservative cabinet ministers. The "insider" likened Liberal Democrat junior ministers to "yapping dogs" who could be largely ignored. Later Ms Jackson was named as the source of these comments. After speculation that she could be offered as a sacrifice to improve Coalition relations, it was reported yesterday that she had been sacked. That was denied categorically by the Department of Health, though the press office would not comment on whether she was still entitled to brief journalists. It is the most serious row involving a Conservative spin doctor since the Cabinet Secretary, Sir Gus O'Donnell, complained to David Cameron about a personal attack on the head of the Electoral Commission, Jenny Watson, attributed to a spin doctor working for Communities Secretary, Eric Pickles. The paper has already drawn its own conclusions about this behind-the-scenes row, attributing it to tensions within the coalition. However, anybody who recalls the spin wars between Gordon Brown and Tony Blair will know that in comparison this is a storm in a teacup. What is remarkable is not that Liberal Democrats and Conservatives are briefing against each other but that the Prime Minister has stopped it so decisively, for now. As a regional Welsh Assembly Member representing South Wales West I was concerned this morning to read this report in the Independent regarding a couple of small earthquakes in the Blackpool area. This seismic activity appears to be entirely unrelated to Blackpool's relegation back to the Championship and has nothing to do with the 4,000 holes in Blackburn, Lancashire identified by John Lennon in a 'A day in the life'. It is altogether more serious than that. The paper reports that a controversial new drilling operation for natural shale gas in Lancashire has been suspended following a second earthquake in the area that may have been triggered by the process. The earthquake last Friday near Blackpool occurred at the same time that the energy company Cuadrilla Resources was injecting fluids under high pressure deep underground to deliberately blast apart the gas-bearing rock – a process known as "fracking", brought to Britain from the US, where it has been highly contentious. This is relevant to my area because a similar operation is proposed for St John’s Colliery in Maesteg, where an application for exploratory drilling has been approved. It also seems to undermine the conclusion by the House of Commons Energy and Climate Change committee that this process is safe. They said that no evidence was found that the controversial method of extracting underground gas poses a threat to water supplies and objections were described as “hot air”. They also said that there would be no disturbance through noise in that area. Others though think differently: Earthquake experts from the British Geological Survey said that the 1.5 magnitude quake last week was similar to a 2.3 earthquake in April in the same area and that both may be linked to the experimental fracking for shale gas at Preese Hall on the Fylde coast. Bans on commercial fracking are already in place in France as well as in New York and Pennsylvania states, where people living close to fracking sites have been filmed setting fire to tap water contaminated with methane gas. "It seems quite likely that they are related," said Brian Baptie of the British Geological Survey (BGS). "We had a couple of instruments close to the site and they show that both events were close to the site and at a shallow depth. "The timing of these two events in conjunction with the ongoing fracking at the site suggests that they may be related." He added: "It is well-established that drilling like this can trigger small earthquakes." In my view this is serious enough to suggest that any operation in the Maesteg area should be suspended indefinitely until more is known about this process and its impact. There is also a case for the Energy and Climate Change Committee to go back to the drawing board and revisit its report. Any possibility of contaminated water supply or seismic activity as a result of drilling is unacceptable.